millions of Russians think global warming is a good idea. More of the talk usually left unsaid – right here on Radio Ecoshock. live there. Will disappearing permafrost change the future for the whole world? You bet it will. Scientists on Radio Ecoshock have warned that sea level rise, not heat, may be the biggest and most costly threat of climate change. We know coastal cities around the world are endangered. But are governments getting the best advice from official bodies like the Intergovernmental Panel on Climate Change? A new report from researchers at the University of Southampton in the UK says “no”. Their commentary, published in the journal Nature Climate Change, says critical risks are not being communicated. The lead author for the paper “Sea-level rise scenarios and coastal risk management” is Professor Jochen Hinkel. He was on Radio Ecoshock this past February. Here to explain the new work is co-author Robert James Nicholls. He’s an award-winning Professor of Coastal Engineering at the University of Southhampton. I reached Dr. Nicholls in the Maldives, an endangered island nation in the Indian Ocean. sea level rise by the year 2100 comes from. far more serious. The most “extreme sea level rise” is what coastal planners on the ground want to know. Once they know how bad it could get, they can decide what berms, levees, dams, or tidal control measures will be needed. Once you spend some billions of dollars on coastal defences, you don’t want to find it breached within 50 years. The paper authors also say the Intergovernmental Panel results are not 100% reliable, because they are based on models, and even those model results are hard to understand. It sounds like we really don’t know. “Sea levels across the Northeast coast of the United States rose nearly 3.9 inches between 2009 and 2010“. We’ll talk to the author of that work, Paul Goddard, in an upcoming Radio Ecoshock show. simple equation for sea level rise. So much depends on other local conditions. The highest global mean sea level rise prediction corresponds to the worst case IPCC scenario, which they call “RCP8.5”. That is the course we are currently on. What would such a world look like, when my 5 year-old grandchild is an older man? forerunners can arrive much sooner. I’m thinking of things like hurricanes, storm surges, and super-tides. If sea levels go up faster and further than the middle-ground IPCC estimates, what would we see around the world? for the extremes, even though that may cost many more billions of dollars in the short-term? Nicholls tells us the most advanced countries in preparing for high sea level rise are the UK, the Netherlands and Germany. London, he says, can be protected for hundreds of years. They are already making plans for 2 meters of sea level rise by 2100.
tidal surge control gates it needs for the 3 entrances to their harbor. But at least, Nicholls says, NYC is built on solid rock, so flood control can work. in the Pacific will also have to be abandoned, and they know it. To hear a longer presentation by Dr. Robert Nicholls, try this one: “Adaptation to sea-level rise” at the Geological Society of London, 2012 Shell Lecture, on You tube here. many countries, Dyer concluded that wars driven at least in part by climate change are an inevitable part of our future history. Find those clips in this show. In a report released in October 2014, the U.S. Pentagon said the same thing. See my links to that Pentagon paper below. Now we have the first peer-reviewed study saying climate wars are not just the future. One may already have happened, in Syria. We have the lead author of a new paper with us, Dr. Colin Kelley. 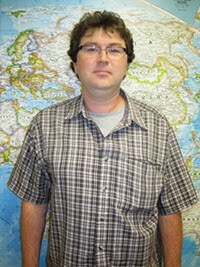 Colin is a post-doctoral fellow and visiting scholar with the Geography Climate Hazards Group at the University of California, Santa Barbara. His paper published in the Proceedings of the National Academy, or PNAS, is titled “Climate change in the Fertile Crescent and implications of the recent Syrian drought“. million Syrian farmers left their land, and went to the city to try to survive. Syrian cities were already overcrowded. The population of the country zoomed from about 5 million in 1950 to over 20 million today. The government of Syria made the situation worse by helping intensive agriculture in North East Syria, considered the “bread-basket” of the country. Before the drought, about one quarter of Syria’s GDP was based on wheat. That disappeared with the drought. Was it a mistake to promote such a water-intensive crop as wheat? drought more than doubled with climate change. They concluded the overcrowding and crashing economy could not have happened without global warming. The authors don’t call climate change a “cause” of the Syrian civil war, but a “catalyst” helping it happen. Therefore, this is likely our first case of a “climate war”. And like everything else about climate change, it arrived decades before the experts expected it! Part of this stage was set by the 2011 study from NOAA, the National Oceanic and Atmospheric Administration. They found “Human-caused climate change [is] a major factor in more frequent Mediterranean droughts”. The NOAA paper of 2011 said sea surface temperatures are the primary driver of drought in the Mediterranean. investigating the impact of climate on the problems in Yemen. Yemen is notorious for mass hunger, even starvation, and it gets very little rain lately. Download or listen to this Radio Ecoshock interview with Dr. Colin Kelley in CD Quality or Lo-Fi. You can read what Joe Romm at Climate Progess had to say about Syria and civil war here. The Dept of Defense press release is here. The actual report “Department of Defense 2014 Climate Change Adaptation Roadmap” was publicly available but has since been pulled from defense.gov. But it’s still available for online reading here. We live on a strange planet. Few people realize that almost a quarter of the land in the Northern half of this world is frozen. Under a thin layer that thaws under the summer sun, the land there is always frozen. It’s called permafrost, and it extends from Alaska, across Northern Canada, Scandinavia, and finds another giant kingdom in the Russian north, in Siberia. New science confirms the world’s permafrost has been slowly thawing. Now with climate change, that pace has quickened. Here to explain what that means for society and the economy of Russia, is Nikolay Shilomanov. Nikolay is an associate professor in the Department of Geography at George Washington University and an Arctic researcher. What is permafrost? Shilomanov says it is just frozen dirt. It has to stay frozen for two years running to be called permafrost. In North America, the small population of the permafrost lands have become accustomed to it. They have adapted to a solid icy foundation. In fact, they depend on it. It’s different in Russia. Due to the Soviet experiments in populating and industrializing their Arctic, there are over 5 million Russians living on permafrost. These are not aboriginal settlements, but serious cities with modern conveniences. All the infrastructure to support those cities, and for the large oil and gas industry, is built on permafrost. As it thaws (land thaws”, only ice “melts”) – there is a real challenge for the foundations of buildings, and long projects like pipelines. About 25% of the world’s gas reserves are found in permafrost lands. Institute managed to measure time and temperature in land ice by taking ice cores from spikes of ice going down into the Permafrost. This is important, because biological markers, like tree rings or pollen, can show the temperature in the summer. But not what is happening in the winter, as the ice samples can. real advantages (for them) in a longer growing season. This interview is based on the paper in Nature Geoscience “Long-term winter warming trend in the Siberian Arctic during the mid-to- late Holocene” by H. Meyer, et al Find the abstract here. Here is a good article about this new research into Permafrost, found in E&E News. Also see this authoritative article from the Afred-Wegener-Institut in Germany. It’s interesting to note that despite the “cold war” between the U.S. and Russia, German and Russian scientists are still cooperating on tracking the impacts of climate change. science isn’t always easy for me, or for you, but we struggle together to understand, and then to act. My special thanks to all the people who contribute real money to this Radio Ecoshock project. You keep it alive! Don’t forget to check out our soundcloud page. We’re are heading toward 20,000 listens there. 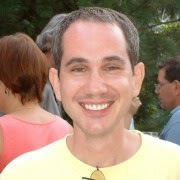 host and producer of Radio Ecoshock, as broadcast on 87 non-profit radio stations, in the U.S., Canada, UK, and Australia, and around the world on the Internet. Now in our 8th year. Thanks for another interesting show Alex. It was 1 hour well spent. I found it rather cynical when DR. ROBERT NICHOLLS said they were trying to inform deciders about sea level rise while so many politicians, like Harper, claim there's no AGW happening. We should have someone like you as PM! recommend lower your voice compared to speaker's voice. russian dude was funny with frozen dirt. permafrost linear infrastructure adaption means more risk and cost per unit of energy. Same with droughts in the west, such as building the Ivanpah solar plant in a desert during a mega-drought. Each of these types of conditions culminates into an overwhelming cascading collapse a la Syria.